As per information provided by the National Crime Records Bureau (NCRB), a total of 10193, 10235 and 10864 cases of cruelty by husband or his relatives (section 498A IPC) were found false or mistake of fact or law after police investigation during 2011, 2012 and 2013 respectively, showing a rising trend. Similarly, a total of 386, 339 and 482 cases of insult to the modesty of women (section 509 IPC) were found false due to mistake of fact or law after police investigation during 2011, 2012 and 2013 respectively, showing a mixed trend. The Ministry of Home Affairs has issued two advisories to the States / UTs to curb misuse of section 498A of Indian Penal Code (IPC) on 20.10.2009 and 16.01.2012 respectively. These advisories inter-alia advises the States/UTs on judicious and cautious application of dowry laws so as to ensure that no innocent person be victimized. 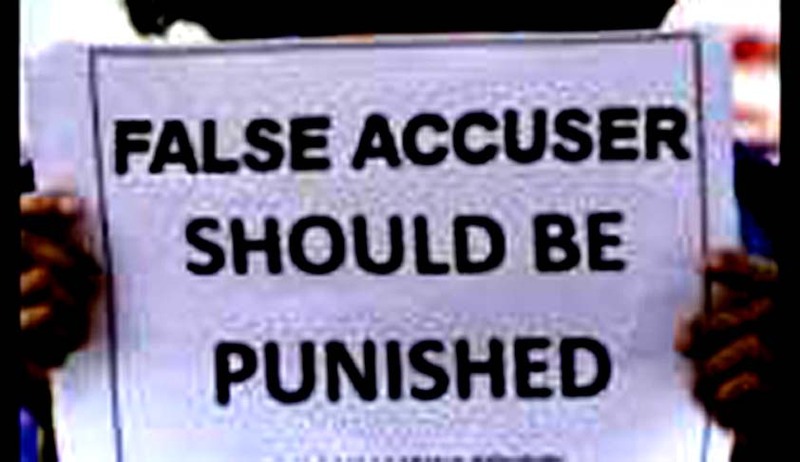 Moreover, the victim of false case can also invoke Section 182 of Indian Penal Code (False information with intent to cause public servant to use his lawful power to the injury of another person) which provides for imprisonment for a term which may extend six months or with fine or both.